WGIRLS recently celebrated 10 years of empowering women and children in under-served communities. To commemorate the occasion, Amy Heller, Founder and President, rang the closing bell. 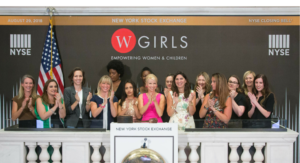 In celebration of more than ten years of volunteering and fundraising, WGIRLS Inc. members and sponsors gathered to ring the bell and showcase their charitable efforts. Amy Heller was joined by current and former board presidents as well as young beneficiaries of WGIRLS programming. WGIRLS Inc. members have donated over 400,000 volunteer hours and $3.2 million to 101 non-profits partners to provide support to 45,000+ women and children. Past partnerships include Women in Need, Children of Promise, Odyssey House and Opportunity Network. The NYC chapter has led efforts to outfit over 14,336 young women in need for prom through Project G.L.A.M. The yearly event provides dresses and accessories to young women across the five boroughs. Past sponsors and donors include: Revlon, Loreal, Eloquii, Faviana, Jay Godfrey, Kendra Scott and Occasion Brands.